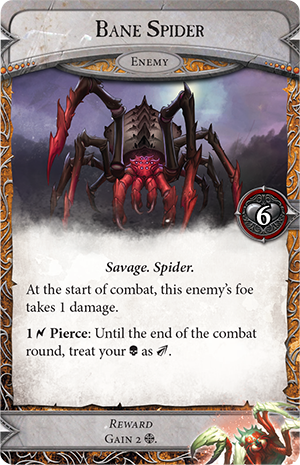 Chittering, insect-like creatures pour out of their dens and tunnels across the realm of Terrinoth, covering cities and roads in webs and deadly ambushes. Trade grinds to a halt, while those unlucky enough to be ensnared are quickly devoured. The danger is obvious, but some suspect there is an underlying darkness at work—behind the webs, someone is pulling the strings. Battle the sorceress Ariad and her sinister machinations in your games of Runebound with the Caught in a Web Scenario Pack! 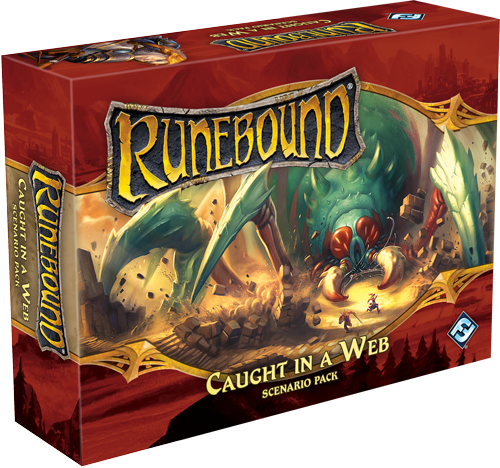 Caught in a Web is the first Runebound Scenario Pack, and as such, it sets the tone for future Scenario Packs like Fall of the Dark Star. Within this expansion, you’ll find an entirely new scenario, forty new adventure cards and story cards, and a new hero, Jonas the Kind. No matter how you use this expansion, you’ll find a brand-new framework for your adventures throughout Terrinoth. Today, we’ll take a closer look at what you receive in Caught in a Web, starting with the new hero, Jonas the Kind. 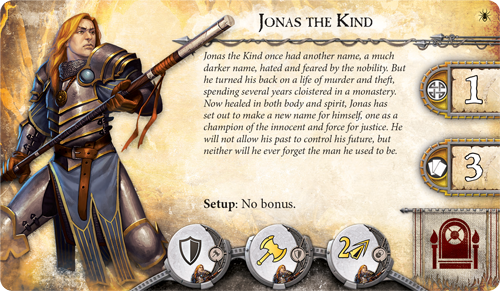 Jonas the Kind was once known by another name—a much darker name, hated and feared by the nobility that he preyed upon. But Jonas ultimately chose to turn his back on a life of murder and theft, spending several years cloistered in a monastery to atone for his sins. Now healed in both body and spirit, Jonas sets out to make a new name for himself as a force for justice. He will not allow his past to control his future, but neither will he forget the man he used to be. Now, with Ariad spreading her evil webs across the realm, Jonas is among the first to stand up for the innocent. Click on the card above to view the reverse side. As Jonas the Kind, your adventure begins in a shrine, as you walk out into the world, reborn as a hero with a mission to cleanse your checkered past. Though you’ve transformed your life into the life of a hero, you still have the skills you learned as a criminal—skills that you can now use for the good of the downtrodden. You’ll notice immediately from the combat tokens on the card above that you have access to an entirely new combat symbol: charge. During a battle against some foul creature, you can spend charge symbols to deal unblockable damage to your foe, slicing straight through any defenses he was able to muster. Unfortunately, the effort of this forceful attack leaves you open to counterattacks. Once you’ve spent charge symbols, you can no longer block damage for the remainder of the round. Still, your own safety is of little importance if you can defend those you’re sworn to protect. Inevitably, you’ll take some damage in the fight, especially if your opponent waits to attack until after you’ve charged. A little damage only makes you fight harder to protect your friends though! 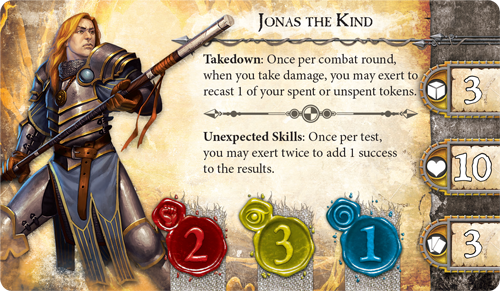 Jonas the Kind bears the Takedown ability, which allows you to exert to recast one of your spent or unspent tokens after you take damage! Jonas the Kind’s unexpected talents aren’t limited to combat, however. Once per test, you can exert twice to immediately add one success to the results—guaranteeing that you can succeed at a test if you have enough skill cards in hand. Your exertions on behalf of Terrinoth won’t go unrewarded, but your skills will still be tested to the limits by the new scenario included in this expansion. Ariad schemes to cover all of Terrinoth in noxious webs, bringing untold pain and suffering, but there’s still some time left before she can transform and invade the Free Cities themselves. 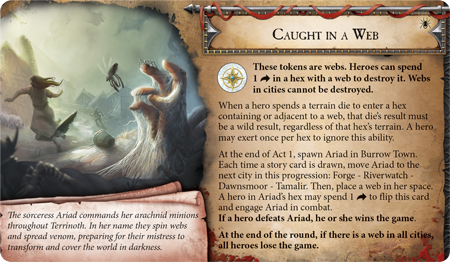 During the first act of the game, Ariad spreads her power through her minions, placing more webs on the map with story cards like Prayers Unanswered and Entangled. 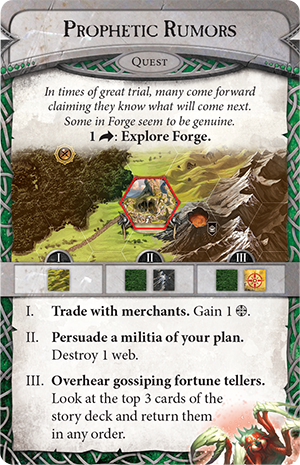 Each of these cards have the power to add new webs to the map, restricting your movement and increasing Ariad’s power—but fortunately, you can remove these webs by enlisting the help of the Forge militia or by heeding the cries of an old beggar. . Of course, you’ll also need to confront terrifying enemies like the Bane Spider as you move across the realm, cutting through webs and helping the people you encounter. 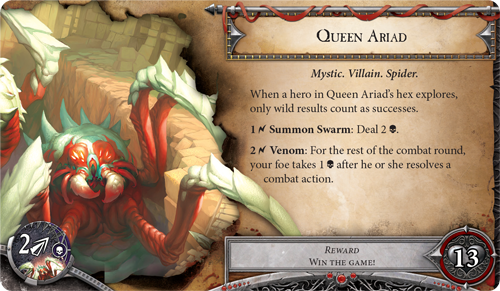 At the end of the game’s first act, Ariad’s dark schemes come to fruition, and she transforms into a monstrous spider-like creature: Queen Ariad. 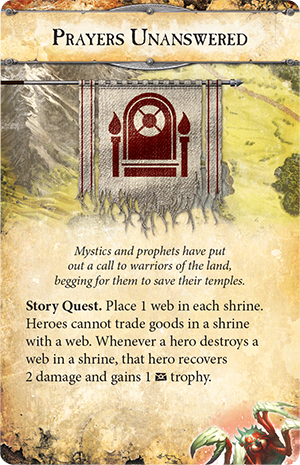 Each time a story card is drawn, Queen Ariad moves to another Free City and places a web there. 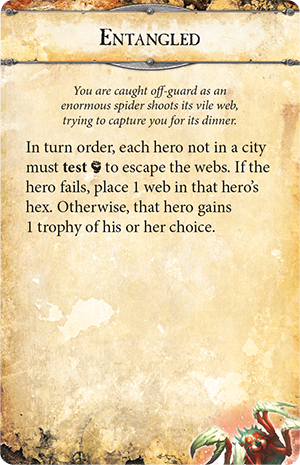 These webs can never be destroyed, and if there’s a web in all four of the Free Cities, all heroes lose the game! 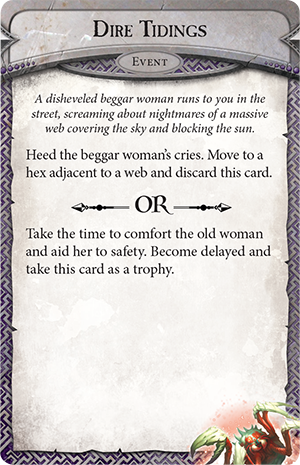 The only way for you to triumph is to find and confront Queen Ariad before she can cover the entire realm in horrid webs. When you do finally bring Queen Ariad to battle, you’ll find defeating her is no easy task, even for a hero with unique skills like yours. Queen Ariad’s special combat token features the new charge symbol, allowing her to deal unblockable damage to you. What’s more, her surges can be converted into a drastic amount of damage. She may summon a swarm of her servants to attack you, dealing more damage, or she may inject you with deadly venom, wearing down your defenses by forcing you to take damage after you resolve a combat action. As with your battles against Margath and Vorakesh, you’ll need to plenty of new assets and skills before you can take on Queen Ariad. You’ll find plenty of both in The Gilded Blade Adventure Pack, which we’ll explore in our next preview! You've spent as much time as you can preparing—now it's time to bring the battle to Queen Ariad herself! When you adventure across the realm of Terrinoth as Jonas the Kind, you aren’t looking for loot or the thrill of battle. You’re here to protect the farmers, travelers, and peaceful merchants that are being terrorized by Ariad and her minions. 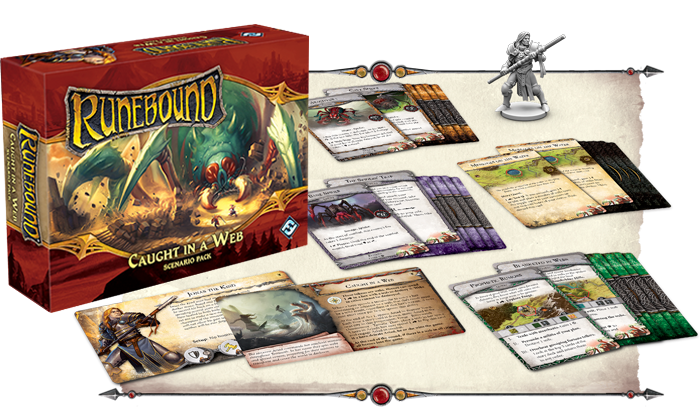 Experience an entirely new scenario for Runebound with the Caught in a Web Scenario Pack, and pre-order your copy at your local retailer today! Runebound is a fantasy adventure board game for two to four players, set in the realm of Terrinoth. 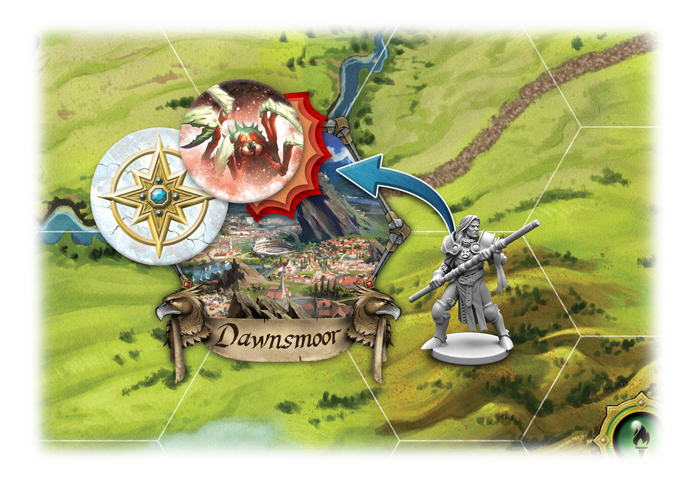 Each player takes on the role of a hero, roaming across the land and taking what adventures may befall you. You'll engage in combat, explore lost ruins and forgotten forests, and experience tense social encounters, but evil is awakening in Terrinoth as well. The first player to defeat this great evil becomes the savior of Terrinoth and wins the game!